News of Daniel Hillig’s killing appeared in social media. As a result, there have been two demonstrations during the afternoon, according to a Police report. Both of these demonstrations seem to have been spontaneous: neither of them seems to have been registered with the Police. The first rally started at around 3 p.m. and consisted of about 100 people. It finished within about one hour and the Police hasn’t reported any incidents. The second rally started at around 5:30 p.m., consisted of about 800 persons and lasted until about 6 p.m. There were some incidents during this rally: the Police report contains allegations of bottles thrown at the Police and of resisting the Police. In all, four charges against persons were made: two of them because of bodily harm, one because of threats made and one because of resisting the Police. The Police report about these demonstrations doesn’t contain any other charges. In particular, it doesn’t contain any charges related to violence against foreigners, to “man hunts” organized against foreigners, or to using forbidden—i.e. Nazi—symbols or salutes. The context of the two “bodily harm” charges and the one “threat” charge is not further explained. Thus, all in all, the events, according to the Police report, seem relatively harmless though the second spontaneous rally was unruly and there was some lawlessness. What, however, the media and leftist politicians made out of these events, grew out of all proportions. There was talk of right-wing mobs “ganging up” and chasing foreign-looking people during regular “man hunts” (“Hetzjagden”), always mentioned in plural. When one looks for evidence for such “man hunts” one finds nothing except a single YouTube video, 20 seconds long, published on the Facebook site of the far-left group “Antifa Zeckenbiss” (“Antifa tick bite”). “Antifa Zeckenbiss” were not the people who made the video: they found it on the Facebook site of a Chemnitz community group and published it as proof of German right-wingers hunting down migrants. The video became known as the “Hase, du bleibst hier” (“Rabbit, you stay here”) video because this is what a female voice says at the beginning, apparently to her male acquaintance or partner. Until very recently nobody knew what immediately preceded the events captured in the video. Neither the media, nor the authorities seemed to be interested in finding and interviewing the person who made the video. (More about the preceding events in the video later, which were recently found out by the German online alternative magazine Tichys Einblick). 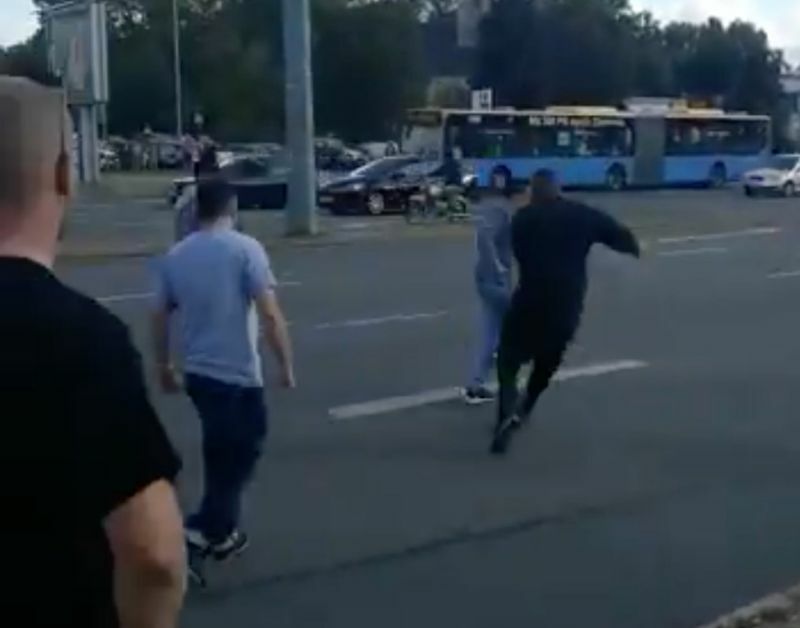 The video shows a black-clad, possibly German, man chasing a foreign looking person for a few seconds. Nobody gets hurt in the video (although the black-clad man tries to kick the fleeing person in the buttock). However, this was enough for German politicians up to the highest levels of politics and for the media to level wide ranging accusations of right-wing violence against foreigners in Chemnitz, eagerly swallowing whole the bait thrown out by “Antifa Zeckenbiss”.